The simplest and quickest designer pillows to make are the 18 inch square decorative pillow with a 1/3 inch edge stitching along all sides. Both the front and back are constructed with the same fabric, which can be made with a cost-saving remnant from your local fabric store. You can choose pre-made throw pillow squares, which are sometimes sold for only one side, letting you choose the fabric and color for the backing. This designer pillows gallery is beautiful, stylish and striking. If selecting a patterned material by the yard for decorative pillow covers, enough must be purchased to place the design in the center. In learning how to make pillows, first decide the number of designer pillows needed. By eliminating a zipper, and stuffing with polyester fill, a group of these decorative pillows can be a swift inexpensive addition to the décor of both a living room and bedroom. Sometimes all is needed is a vibrant and wild fabric remnant to create an whimsical accent pillow with little effort. Again, make without a zipper to save time and firmly stuff with polyester fill. The success of this project is all in the trimmings. Hot glue, some ribbon and sequins and you will have a one-of-a-kind designer pillow that looks like it was purchased in a interior design boutique. An even easier way to create designer pillows is to purchase a plain, inexpensive accent pillow from an outlet store and get creative with the trimmings. Hand-sew some lace or tassels, hot glue some sparkly trimmings and instantly you have added a “wow” accent pillow to your setting. Other free accent pillow ideas can be found online. Although most pillows are square, round or rectangular in shape there are other shapes that can make a statement. A random shaped novelty pillow can add a splash of color or entertainment to your throw pillow arrangement and make a decorating statement. Find free novelty pillow ideas online for great novelty pillows. Most are made in readily identifiable shapes (triangles, hearts, stars, and fish). It is also possible to create a unique accent pillow in any shape you desire. Today you can print personalized cotton fabric to customize designer pillows and other craft projects. The fabric made by Avery for your inkjet printer is made out of 100 percent cotton and features a heat-seal backing that bonds to fabric, cardboard, wood and other porous surfaces. You can even hand wash Avery fabric with a mild detergent. These fabric sheets are ideal for printing photos, patterns, images or designs of any type to use to make a novelty accent pillow. Handcrafted decorative pillows accent your home with simple elegance. You can download free needlepoint designer pillows designs to embroider yourself to make a unique pillow to harmonize with your interior decor. The covering for the sofa bears so close a relation to the pillows that one may never be planned without considering the other. These needlework patterns can be customized in colors to harmonize with your décor. 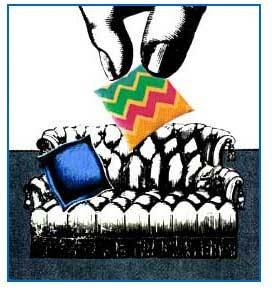 An easier alternative is to purchase needlepoint kits for pillows. Kits feature quality components including the design hand-painted on mesh canvas, pre-sorted yarn, needle and directions. You provide the backing to coordinate with your color scheme and the pillow insert. Many shops that sell needlework supplies stock small round pillows designed for needlework complete with plain fabric in the center. An oblong decorative pillow can coordinate with the sofa fabric or be used as a contrasting throw pillow. The pillow measures 12x20 inches and is finished with a knife edge. Its placement adds an extra layer of texture and detail to your room décor. By eliminating a zipper and stuffing with a polyester fill pillow insert, these designer pillows ideas are perfect projects for a beginner. An easy pillow style to add decorative trim with little effort is the oblong accent pillow. This 22x14 inch decorative pillow is made from an embroidered remnant and easily ornamented with silk tassel fringe, adding a luxurious and formal feel to the setting. Skip the zipper, stuff with polyester fill or a pillow insert and you have a completed project done in no time. Some craft stores feature pre-cut and pre-stamped fabric for pillows with a center design. All that is necessary is to stitch, stuff, and enjoy your new throw pillows. Michaels craft store features pre-cut craft fabric for throw pillows, including cotton, canvas, burlap, felt, faux fur, crushed velvet and tulle, available in a variety of sizes from a half-yard to 2 yards. Moreover, their laminated burlap can be fed through most home printers to add personalized quotes and images to pillow projects. You can also use printed fabric napkins or placements to create a collection of matching throw pillows. Napkins with two layers work best. Make your own arts and crafts designer pillow in beautiful combinations of coloring. In the early 1900s, the love of fine needlework grew so rapidly among women of leisure that the designers of patterns for embroidery could scarcely keep up with the demand for new pillow ideas and artistic variations upon the old ones. In some of these unique designs the severity of the conventional lines became slightly softened by the introduction of floral patterns. Where the floral design was used outright, the form and coloring of the flower was true to life. The dainty pond lily design shown in this vintage designer pillow design is worked in cool shades of green on light tan linen. The form of the leaves and flowers is slightly conventionalized, which seems to add greater beauty to the shape of this lovely flower. The petals are worked in Long and Short stich not padded but filled in rather heavy at the top. A shade of white is used for this, shaded at the middle and bottom with light green, using dash stitch of white through center of petals. The short curved sections of petals showing on top of the flower are filled in well with a Solid stitch. 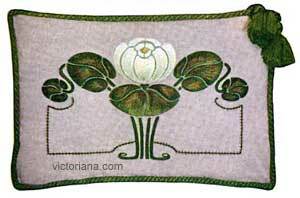 The leaves are worked in Long and Short stitch in shades of green filling in center of leaves with small French knots. The upright stems are done solid in the darker Green. There is a yellow center for the flower and the outlines are done with Green couched down. 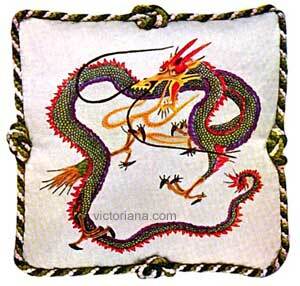 Embroidered designer pillows, though time-consuming in creation, can produce a detailed and realistic scene. By using a variety of colors and shades, a three dimensional quality can be achieved. Whether imitating a floral design, replicating a nature scene, or even creating this early 1900s fantasy dragon sofa pillow, the time and effort put into a needlework pillow is rewarded in the finished product. The foundation of this very realistic pillow design is green art ticking. The body, which is tinted in green, is covered in Honeycomb stitch with a double thread of silk in blue and green and a tiny stitch of yellow is placed in the center of each square. This gives the iridescent scare effect so much to be desired. The ridge along the back is worked in Long and Short stitch with red floss. The scales on the underside of the body are done with purple floss. Brilliant red and yellow appear on the head. Red is used for the horns and inside of mouth, both being worked in Feather stitch, and the rest of the head in yellow. Yellow is also used for the forked tongue, the edge being outlined with a darker shade of yellow. The nostrils are indicated in black, and the antennae are worked in Satin stitch with the same color. Lines of black and white surround the eyes and the centers are indicated by yellow jewels. The feet are outlined with brown, and the claws are worked in Satin stitch with black.